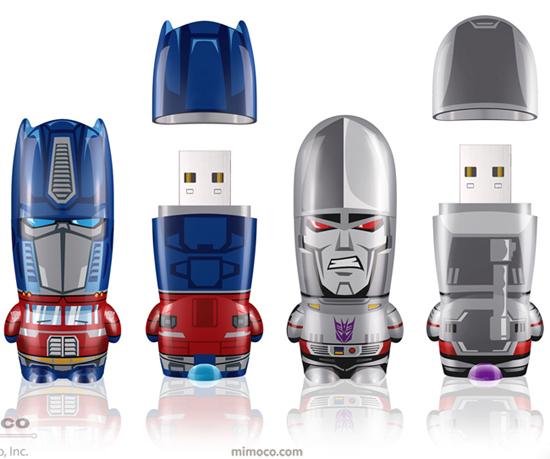 Transformers characters are now available as tiny Mimobot USB flash drives just in time for Transformers 3. The new line of Mimobots called, Transformers X, includes both leading Transformers characters Optimus Prime and Megatron. Transformers fans can now keep one of their favorite Autobots or Decepticons figurines in the palm of their hand. Both of these new Transformers Mimobot USB flash drives are available in a variety of storage capacities ranging from 2GB - 16GB, with prices ranging from $22.95 - $59.95. The drives come preloaded with bonus media including digital editions of classic comics, videos, and scripts alongside the MimoDesk™ suite of screensavers, avatars, and more. Grab your Mimobot and roll out!